Buy Regent Gift Cards in bulk, you choose the value! Use the value for tickets, Candy Bar items, Gold Class food and beverage. With a Gift Card, you’re not restricted to a single product, choose between tickets, food, drinks and more! With the new 2 Year Expiry period on Gift Cards, there is plenty of time to use all the value! 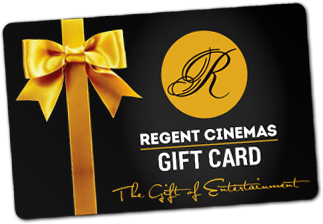 Clients, staff and friends will all appreciate a Regent Gift Card as everyone loves the movies! Include a Gift Cards as a prize in a fundraising raffle. An alternative to our Catering Packages, combine a gift card with your event for food & beverages. Regent Gift Cards can easily be used to book tickets online! Choose as many Gift Cards as you like, with your choice of value!